For centuries, many have enjoyed smoking a fine cigar. While some enjoy the flavors of the quality tobacco, some enjoy the environment and community of cigar smokers and trip to the cigar shop, some smoke cigars to celebrate, and others see cigars as a symbol of status and wealth. Whatever the reason, cigars have been have been enjoyed long before Christopher Columbus introduced tobacco to Europe in 1492, and long before the word cigar came to fruition in 1730. While there is a wealth of cigar knowledge available regarding the growing, rolling, history, variety and enjoyment of cigars, this primer serves to inform novice smokers on everything they need to know to make an educated choice in choosing, smoking and enjoying a cigar. Once you have finished our Cigar 101 and would like to learn more about cigars, head over to the our blog for a wealth of information on the history, manufacturing, smoking and culture of cigars. Cigars come in many shapes and sizes. The two common measures used for a cigar are its length and ring gauge, with a third factor being the shape and construction of the tip. Churchill: 6 ¾ to 7 ¾ inches in length, generally with a ring size of 46-52. Named for Winston Churchill who preferred this size of cigar, Churchills require patience because if smoked too quickly the cigar will overheat and become harsh. Take your time and thoroughly enjoy a long quality smooth smoke. Due to their length, Churchills tend to smoke very smooth and cool as compared to many other sizes. Robusto: 4 ½ to 5 ½ inches in length with a general ring size of 48-54. This is a great cigar for the modern pace of life, this is not the type of cigar that you have to sit down for three hours to smoke, although you could. Because of their shorter and wider size, Robustos tend to smoke a little stronger and provide more of a kick than a Churchill. Toro: Similar to a Robusto but longer, often with a length of 5 ⅝ to 6 ⅝ inches. Torpedo: Generally around 6 ⅛ inches in length with a ring size of around 52. The tapered head is purposefully designed to reinforce the power of these cigars while a wider cigar to be smoked with a smaller mouth that many find more comfortable. Panatela: 5 to 7 ½ inches in length with a ring size of 34-38. These type of cigars are long, thin, elegant and always a classy choice for the cigar aficionado. Panatelas tend to smoke hot and strong due to their thin ring gauge. Cigars are made up of three different parts -- the filler, the binder, and the wrapper. For premium cigars, all three parts are made from quality tobacco, allowing the cigar to be made entirely of high-quality tobacco that contains no additives and has only been processed naturally. The Binder is the tobacco leaf which holds the filler in place. The filler is held in place while the binder is wrapped around it to provide structural support and the overall shape of the cigar. Binders are often made of tobacco earmarked to be wrappers that did not have the ideal look to be placed on the outside of the cigar due to slight blemishes, inconsistent color, or excessive veins. The Wrapper consists of high quality tobacco leaves that are wrapped around the binder to compose the outer layer of the cigar. The wrapper provides much of the flavor of a cigar, so the type, quality, and color of the wrapper is a strong influencer of how the cigar will taste. Since the wrapper is the outmost tobacco in a cigar, it is also common for manufacturers to choose leaves that have a consistent color free of blemishes and significant veining to make the cigar visually appealing. Connecticut wrappers are shade-grown tobacco leaves from Connecticut seeds. They are typically grown either in the United States or in Ecuador. The process of shade-grown refers to being grown under giant sheets of cheesecloth. This helps prevent the leaves from being exposed to too much sunlight, which gives them a milder and extremely smooth flavor profile. The taste that the leaves embody is dependant on the length of time that the leaves are aged. Connecticut wrappers can give a spicy, ammoniac aroma, or sometimes a peppy taste. Because of their low sugar content, Connecticut wrappers tend to retain a more "dry" taste than the darker wrappers. Maduro wrappers are the “mature” or “ripe” cigar leaves, which gives them a dark brown color. The process of making a Maduro wrapper can takes years to accomplish properly, which adds to their sense of maturity providing a stronger, more complex, and heavier flavor profile. The tobacco leaves are picked and then cured in a barn until the green leaves turn into a rich brown color, taking up to 45 days. The Maduro leaves are then aged for several years, which brings out the natural sugars in the tobacco leaves, giving the cigars a darker color and distinct caramel sweetness. Leaves used to make Maduro wrappers are significantly thicker than non-maduro leaves, allowing them to withstand a longer fermentation and maturing process without disintegrating. Maduro wrappers can produce a variety of flavors depending on how long they are aged, including dark chocolate, coffee, brown sugar, caramel, molasses, black pepper, dried fruit, and black cherry. Maduro wrappers tend to offer a more full, sweet and rich flavor. Double Wrap cigars feature two wrappers, often a Connecticut wrapper and a Maduro wrapper that are inter-rolled along the cigar. The double wrap process allows cigars to benefit from the flavor profiles of both types of wrappers, providing a hybrid flavor. For example, the combination of a Connecticut wrapper and a Maduro wrapper provides a taste that may be smoother than a straight Maduro, but more rich than a straight Connecticut wrapper. Cameroon wrappers originate in Cameroon, Africa with the seeds either being grown in West Africa or more recently in other countries like the Dominican Republic. Cameroon wrappers tend to have a very distinct "toothy" grain. Rich and peppery, yet smooth and manageable, Cameroon wrappers are very versatile and can be used to make both mild and strong cigars. Habano wrappers are generally grown from Cuban seeds giving them a flavor profile and spiciness that resembles that of a Cuban cigar. Strong, spicy, cedary and espresso are just some of the many flavors you will get from cigars that have Habano wrappers, along with a strong nicotine rush. Darker in color than a Natural wrapper, yet lighter than a maduro, a high-quality Habano wrapper tends to be a dark and rich brown color that often has more oily shine. Habano wrappers are generally grown in countries with soil that is suitable to growing strong tobacco, with the largest producer of Habano wrappers being Nicaraguan. Sun Grown Habano wrappers combines a blend of prime Nicaraguan and Dominican tobacco, wrapped in Sun Grown Habano leaves. The Sun Grown Leaves produce thicker, darker wrappers, making for a sweeter smoke. This medium- to full-bodied cigar contains hints of toasted sweet vanilla and dark cocoa bean, allowing for a perfectly well-rounded smoke. Short-filler cigars consists of chopped up tobacco leaves, which are then rolled into cigars. The tobacco in a short-filler cigar often comes from pieces of the leaf that have been discarded during the process of rolling long-filler cigars. Short-filler cigars tend to burn hotter and quicker than their long-filler counterparts. By using short-filler tobacco and using machines to aid the cigar rolling process, manufacturers can substantially reduce the cost when compared to a hand-made long-filler cigar. Medium-filler cigars consists of chopped up tobacco leaves which are chopped into pieces larger than short-filler. Larger pieces of tobacco results in a slightly smoother smoke than short-filler cigars, but medium-filler cigars are still a significant step down in quality from long-filler. Some manufacturers also use the term Medium-filler to refer cigars which contain short-filler tobacco rolled inside of long-filler leaves which are then wrapped up by a binder and wrapper. The combination of short and long filler within a single cigar has also been called a "sandwich" or "Cuban sandwich" in an attempt for some manufacturers to more optimally market what would otherwise be considered a short-filler cigars. Long-filler cigars consists of whole tobacco leaves that when rolled run the length of the cigar. Long-filler cigars are of a higher quality than short-filler cigars and tend to not only burn for a longer period of time than their shorter counterpart but also tend to smoke cooler and smoother. Most "premium" cigars are made entirely of long-filler tobacco, wrapped in a quality binder and wrapper. Dominican cigars are perfect for new and occasional smokers as they tend to have a little bit more subtle of a flavor and are often available in mild and medium blends. Don’t let this fool you though, because these cigars still have a lot of flavor with complex and unusual blends. The versatility of Dominican cigars have led to the Dominican Republic becoming the largest product of premium cigars. Nicaraguan cigars are great for the smoker who wants a cigar that really packs a bunch. Nicaraguan cigars are very full, spicy and full of flavor. If you are looking to flirt with your wild side, these cigars are great for you. The complex and rich flavor of a Nicaraguan cigars have made it a common choice for some of the best cigar manufacturers in the world and many avid cigar smokers. Cuban cigars have traditionally been the finest cigars, but advancements in farming technologies have allowed other countries to obtain the same quality and flavor profiles once only available from Cuban soil. Further, Cuban cigars are illegal in the United States and many connoisseurs have expressed a decrease in the quality of Cuban cigars as a result of the land being overworked despite skyrocketing prices. These factors make Dominican and Nicaraguan cigars a great alternative, with Nicaraguan cigars having a stronger flavor profile that many find to closely resemble that of a Cuban cigar. In olden days smokers would bite off the tip of a cigar to create an opening. This crude method worked, but often would also damage the end of the cigar, causing it to open and let tobacco into the smoker's mouth, part way through the cigar. Others may also use a razor blade or knife, but still run the same risk. Fortunately, many options are available to consumers, with each type of cut providing a different appearance and smoking dynamics. Straight Cut is the most basic type of cut. It can be made using a single blade guillotine cutter, but a double blade cutter is highly recommended since it makes a significantly cleaner cut. For a more precise cut, one can also use cigar cigars, scissors specially designed for cutting cigars. However this requires additional skill to make a clean cut. When making a straight cut, it is important that you cut enough of the cap so that the cigar draws smoothly, but not to much of the cap such that the end of the cigar opens and allows tobacco through. 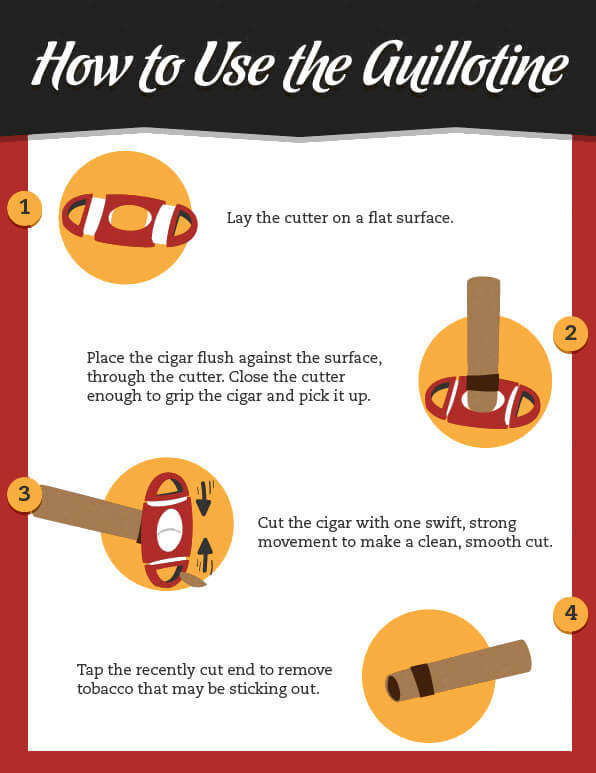 V-cut or Wedge Cut slices a wedge into the cap of the cigar into taking it entirely off in a straight cut. This provides a more consistent cut without the risk of taking cutting too deep or cutting on a diagonal. Some prefer the V-cut stating that it provides for a smoother smoke, while others either prefer a straight cut or are indifferent. Hole Punch does not cut off the cap of the cigar, but rather embeds a hole into it. If the hole is too small, the cigar may not draw properly and while smoking tar form the cigar can sometime accumulate around the hole. These factors can affect the flavor of the cigar in a way that some smokers prefer and others may not. Cigar smokers all across the world often argue what is the best fuel to ignite a cigar. Some like wooden matches in that they burn cleanly with no gas that can contribute to the taste of the cigar. Others like the convenience that flame lighters provide over matches and do not feel that proper gas contributes to the smoke. While others prefer torch lighters which burn strong, more evenly and are resistant to wind, others argue that torch lighters burn too hot and often scorch the cigar. Then you have a different class of purist smokers that prefer to light a stick of cedar with a match, and then light the cigar from the burning stick of cedar to get a little bit of spice from the cedar. While there are many types of flames that can be used to light a cigar, the proper way to prime a cigar is generally less debated. With the flame of your choice lit, slowly rotate the open end of cigar (also known as the foot of the cigar) just above the flame. Priming a cigar heats up the tobacco's natural oils, evenly distributing them across the end of the cigar. Next, without allowing the flame to touch the cigar, hold the flame ½ inch from the end of the cigar while gently rotating the cigar and beginning to puff it. This allows the heat of the flame to slowly and evenly be drawn into the cigar, creating a slow, smooth and even burn. Direct exposure to the fire, rapid puffing during the initial light, or not rotating the cigar can cause the cigar to light too quickly, ignite unevenly, and burn too hot. Burning a cigar too hot, also known as 'roasting' a cigar, can create a harsh taste which can carry through until the end of the cigar. Slow and steady wins the race! While smoking the cigar, it is important to pay attention to the ash of the cigar and handle it properly. Unlike cigarettes, it is not considered proper etiquette to frequently flick or tap the ash of a cigar, as that can interfere with the even and consistent "cherry" of the cigar. Rather, smokers should be patient with their cigar -- not ashing until the ash is about an inch long, or a crack in the ash begins to develop. When ashing, rest the side of the ash of the cigar gently against the inner part of the ashtray, and gently rotate the cigar while slowly pressing the ash into the ashtray. This should allow the ash to break off evenly, almost in a twisting-off motion without it breaking off unevenly or being pressed into the 'cherry' of the cigar could affect the way the rest of the cigar smokes. While it is generally good to smoke a cigar all the way through to completion, if you need to take a break, avoid extinguishing the cigar as you would with a cigarette. Rather, place the cigar down in an ashtray and within a couple of minutes it should slowly put itself out. With lighting and ashing of the cigar down to a tee, you can now enjoy the cigar like a connoisseur. While smoking the cigar, gently puff and take note of the flavors. Move the smoke around in your mouth and slowly exhale taking note of the richness, complexity and spices of the cigar. Do you notice any interesting flavors? Chocolates, cognacs, vanillas, or caramels? Is the cigar spicy, sweet, roasted, or smooth? Does the cigar have any earthy, woody, or nutty flavors? What about fruity and sweet flavors? How does the construction of the cigar feel in your hand and your mouth and you puff and enjoy the cigar? Is there a nice color and build up of oil as you smoke it? How does the color, sturdiness and evenness of the ash look? It is generally best to smoke the entire cigar in one sitting, as letting a cigar go out for an extended period of time and then relighting it can provide stale and harsh flavors. As you progress through the cigar, flavors will change with the cigar smoking a little bit hotter and richer as it gets shorter, and the oils from the first half of the cigar building up into the second half of the cigar. As a result, many connoisseurs consider the remaining ½ to ¼ of the cigar to be the best part, as it contains the buildup of oils and flavor from the rest of the cigar, while others may find the end of the cigar a little bit too strong for their liking. Avoid the temptation to smoke the cigar too fast and "hot-box" it. Similarly, do not smoke the cigar too slow or you will not be maintaining an even temperature and distribution of oils burned off of the cigar which will lead to the cigar going out and a less even flavor. And most important of all, kick back with some good company, tell a couple of jokes, relax and enjoy a nice drink with your cigar. Diameter - Ring gauge, based upon 1/64 increments, is the most common unit of measurement of the cigar's diameter. Accordion Method - A method in which the leaves are folded into a wavy pattern, resembling an accordion. This method tends to create cigars with dependable draws. Band - A ring of paper wrapped around the closed end of most cigars. Belicoso - A figurado-shaped cigar that tapers sharply at the head. Binder - The part of the tobacco leaf that holds the blend of filler leaves, also known as the bunch, together. Blend - The mixtures of various tobacco types that are in a cigar; this includes the filler leaves, an outer wrapper and a binder leaf. Bloom - A natural occurrence in the cigar aging process, that appears as a fine white powder. This is not the same as mold, which appears blue in color. Blue Mold - Blue mold, also known as Peronospara tabacina, is a fast spreading fungus that can completely destroy a tobacco field in just a few days. It leaves small round blemishes on the tobacco. Booking - This is a rolling method where the filler leaves lay on top of one another and are then rolled up like a scroll. Bouquet - The smell of a fine cigar. Box - The container used to package cigars. There are several traditional styles: - cabinet selection refers to wood boxes with a sliding top, designed to hold 25 or 50 cigars. - 8-9-8 refers to a round-sided box specifically designed to accommodate three rows of cigars - eight on top, nine in the middle, eight on the bottom. - flat top, or 13-topper, is the flat rectangular box most popular today, with 13 cigars on top and 12 on the bottom. divided by a spacer. Box-pressed - The slightly squarish appearance taken on by cigars packed tightly in a box. Bull's-Eye Piercer - A device that opens up the closed end of a cigar (done before smoking); It makes a circular opening.. Bunch - Consists of up to four different filler tobacco types; these are blended to create the body of the cigar; the bunch is then held together by the binder. Bundle - A packaging method that contains 25 or 50 cigars without bands; the bundle usually uses a cellophane overwrap. Burros - The piles, or bulks, in which cigar tobacco is fermented. They can be as tall as a person and are carefully monitored. If the heat level inside them gets too high (over 110°F), the burro is taken apart to slow the fermentation. Cabinet Selection - A packaging method that is better when purchasing cigars for aging; this selection features cigars that are placed in a wooden box rather than the standard cardboard or paper-covered cigar boxes. Candela - A bright green shade of wrapper, achieved by a heat-curing process that fixes the chlorophyll content of the wrapper while it's still in the barn. Also referred to as double claro. Cap - Used to secure the wrapper; it is a piece of the wrapper leaf that is at the head of the cigar. Carotene - A naturally occurring compound found in aged cigars. Cedar - The kind of wood that most cigar boxes and humidors are made of. Chaveta - The type of knife that is frequently used in a cigar factory for cutting the wrapper leaf. Cigarillo - A small cigar around the size of a cigarette. Churchill - Traditionally the Churchill is a larger cigar made in honor of (and made popular by) former British Prime Minister, Winston Churchill. Normally a Churchill is 6.75 to 7 inches long with a 48-50 ring gauge. Claro - A pale-green to light-brown wrapper, usually shade-grown. Clear Havana - A cigar made in the United States prior to the embargo with Cuban tobacco. Colorado - A medium-brown to brownish-red shade of wrapper tobacco. Corona - Traditionally this cigar is 5.5 inches with a 42-44 ring gauge. Culebra - A style of cigar where 3 thing cigars are rolled together into a "snake" (the literal meaning of the word Culebra). How it came to be is subject to debate, but one opinion is that it was done as a way for cigar rollers to increase their daily cigar allowance. Instead of being able to take home only three cigars, by rolling three culebras they could effectively take home nine cigars. Some believe it was done so that the cigars curved cigars would not pass quality control enabling the rollers to smoke them, while others believe it was done to provide a rare and unique looking cigar. To smoke a culebra, uncut the ties, unbraid the three cigars, and cut and smoke each cigar individually as you would with a normal cigar. Corona - The most common shape and size used for premium cigars; it usually has straight sides with a rounded, closed head and an open foot. Cuban Seed - Plants grown outside of Cuba from seeds that originated from Cuba. Since the US Trade Embargo prohibits Cuban grown tobacco to be imported into the US, many tobacco producers have taken the very same tobacco seeds used in Cuban and have attempted to grow them outside of Cuba, in environmental conditions mimicking that of Cuba. Draw - The amount of air that gets pulled through a lit cigar. Double Corona - A larger, but not quite double, corona cigar that is 7.0-7.5 inches long with a 54-58 ring gauge. Entubar - A rolling method that involves folding each individual filler leaf back on itself and bunches the leaves together. Filler Leaves - These are the tobacco leaves that make up the body of the cigar. Finish - A tasting term. It refers to the taste that lingers on your palate after a puff. Mild cigars do not have much finish, either in terms of length or complexity. But stronger, more full-bodied cigars have distinctive flavors that linger for a while. Foot - The end of the cigar; this is the part that you light. Giant - The Giant, also called an "A" is formidable parejo-shaped cigar that is typically 8.5-9 inches long with a 52 (or more) ring gauge. Gum - The vegetable adhesive that secures the head of the wrapper leaf to the finished bunch. . Also referred to as cigar glue. Handmade - A cigar made with a high-quality wrapper and long filler; these are made by hand. Hand-rolled - A cigar made entirely by hand with high-quality wrapper and long filler. Head - The closed end of the cigar; the end you smoke. Humidor - An enclosed area of varying sizes that is designed to preserve the storage and aging of cigars; it achieves this by maintaining a relative humidity of 70 percent and a temperature of 65°F to 70°F. Hygrometer - A device that indicates the humidity of the humidor. Lance - A device used in piercing a small hole in the closed end of a cigar. Lancero - This cigar is a shape that was popular long ago and has been gaining popularity again. A Lancero is a long thin cigar, usually between 6.5-7.5 inches in length and between 38-42 ring gauge. Ligero - One of three of the basic types of filler tobacco. Long Filler - A cigar in which the filler tobacco runs the length of the body of the cigar as opposed to the chopped pieces characteristic of machine-made cigars. Lonsdale - A longer thinner cigar that is typically 6 inches by 42 ring gauge. Machine-made - Cigars made by using a heavier-weight wrapper and binder; these are made entirely by a machine. Maduro - A wrapper shade from a very dark reddish-brown to almost black. The word means ripe in Spanish. The color can be achieved by sun exposure, a cooking process or a prolonged fermentation. Oil - Characteristic of a well-humidified cigar. Oscuro - A black shade of wrapper, darker than maduro, most often Brazilian or Mexican in origin. Panetela - A long, thin cigar, generally around 6.5 to 7 inches long with a 28-38 ring gauge. Parejos - Straight-sided cigars, such as coronas, panetelas and lonsdales. Perfecto - A distinctive cigar shape that is closed at both ends, with a rounded head; usually with a bulge in the middle. Plug - A blockage in the tobacco that can occur; this can prevent a cigar from drawing properly. The plug can sometimes be removed by massaging the cigar. Primings - The arrangement of leaves on a tobacco plant; this can vary; the row closest to the ground is the first and the row near the top is the sixth; the higher up the row or arrangement means that the tobacco is stronger. Puro - A word that differentiates a cigar from a cigarette. Pyramid - A cigar with a larger ring gauge foot that uniformly tapers to a small ring gauge at the head. Robusto - A short thick cigar usually 5 inches long and with a 50 ring gauge. Robusto Grande - This size is usually a longer, thicker robusto, typically 5.5 inches long and with a 56-58 ring gauge. Robusto Gordo - A fat Robusto at 4.5-5.0 inches by 60 ring gauge or larger. Rothschild (see also Petit Robusto) - A short version of a robusto, usually 4.5 inches with a 48-50 ring gauge. Ring Gauge - The diameter of a cigar is measured with a ring gauge; based on 1/64? increments. Rosado - A Spanish term that means "rose-colored." It is used to describe the reddish tint of some Cuban-seed wrapper. Seco - A term meaning dry; this is a type of filler tobacco. Shoulder - The part of the cigar in which the body meets the head; if this is cut into, the cigar will unravel. Short Robusto - A short Robusto that is typically 4.0-4.5 inches by 48-52 ring gauge. Sugar - Sugars can appear naturally in tobacco, making the taste sweeter. Sun-grown - Tobacco that has thicker leaves and veins due to their exposure to direct sunlight. Tercios - The large, palm bark-wrapped bales in which fermented tobacco is shipped to cigar factories. Toro - A parejo-shaped cigar that is most commonly 6 inches long with a 50-52 ring gauge. Toro Gordo - Typically a fat Toro at about 6 inches by 60 ring or larger. Torpedo - The Torpedo is typically 6.0-6.5 inches and has a larger ring gauge shaft (often 52-56 RG), which then gently tapers to a point. If you think you are the only one who can't tell the difference between a Belicoso and a Torpedo... think again. This is a distinction that will continue to elude you. Manufacturers have their own preference between what constitutes a Torpedo and a Belicoso (or Pyramid, for that matter). Tubos - Cigars packed in different manners, such as wood, metal or glass tubes, in order to preserve them and maintain their freshness. Tunneling - A problem in which a cigar burns unevenly; it is avoidable by rotating the cigar every once in a while (while smoking). Vein - A structural part of a leaf; the more prominent leaves can cause defects in the wrapper. Volado - Another type of filler tobacco; it is recognized and preferred for its burning qualities.